Marc Marquez topped all three days of this week’s opening MotoGP™ test at Sepang, not least on Thursday when he went quicker than the previous test record achieved by Casey Stoner. The World Champion reviews his impressive three days which capped off an enjoyable off-season for the soon to be 21-year-old. You haven’t stopped this winter. Can you not stay away from racing? It's been a winter of two parts. The first was dedicated to events and press and the second part to a bit more fun and things like Dirt Track racing, driving cars or karting. It is always good to keep active. 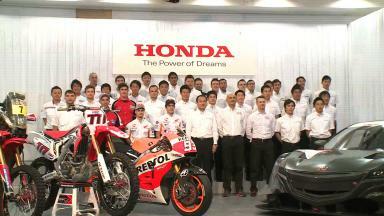 In December you spent a day training Trials with Dani Pedrosa, Toni Bou and Takahisa Fujinami. How was that experience? Very good. I had tried it once before, a long time ago, but this was the first time that I’d really trained Trials. We had a lot of fun and plenty of laughs, which is important. Now that I have had that experience, I have a taste for it and a Trials bike in my garage to practice occasionally. Have you trained Trials since then? Once - I haven’t had more time. To have fun, my brother and I will do it again from time to time. I’m doing pretty good. It’s normal that my hand is like this after a first test, but the truth is that I felt rather good. Every day I felt better. The first day I was a little weak, because I was recovering from the flu and was a little tired. I wasn’t in my best shape, but the test saw me feel better with every day. We also did a race simulation which went well. I just have to keep preparing and improving, but in the end the best training comes on the bike. What conclusions did you draw from the race simulation? We saw that we can improve our cornering and exiting, and also trying out the new Bridgestone tyre was very positive; they worked very well and I like them. They are similar to the previous ones, but the new ones have good grip and are very consistent from start to finish. Does the Honda seem just as competitive this year with the fuel limit being lowered by a litre? Yes, at the moment we haven’t had any problems with fuel consumption. Maybe we will have at some circuits, but right now we are okay in this regard. This change also means that we have to balance the bike, because it isn’t exactly like before and there are some small differences. How is Marc Marquez different today to this time last year? I have more experience and you can tell this a lot - both on and off the track. I remember that last year I was on the limit on every lap, and this year it is different. I am finding the best way forward more quickly when it comes to trying things out. That is important for Honda. How do you face the 2014 season? This year the first thing to do is focus on pre-season. When the season starts, of course we are going to fight for the title again and try to be competitive from the start. Did you make any big changes in the test to find out what works? It depends. At the moment we have checked that our base setup is good, with the information that we had from the 2013 bike. But yes, sometimes it is good to make big changes to see if they work better or worse, because with smaller changes you always have a little doubt. One of the things to improve this year are your starts. Have you been practicing them? Yes, I made some practice starts and I have improved a little, but one thing is to do it here with no noise, and another is doing it in a race. This year you have some old Moto2™ rivals on-track with you. How are they looking? Pretty good. Depending on how someone does in Moto2™, you can set out your expectations for them. I expected Pol (Espargaro) to be fast and he did well on his first time here in Malaysia with the MotoGP™ bike. (Scott) Redding looks big on-board the Honda. MotoGP™ is all about how you finish, not how you start, and I’m sure that during pre-season and the season they will both progress. 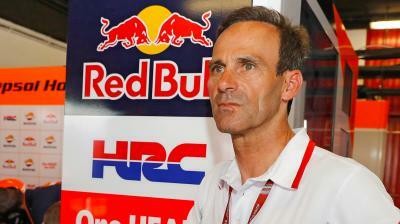 Pol, with a MotoGP™ factory (Factory Option) bike, will be up at the front this year. Do you feel more pressure, having won the championship? It is different. For example, last year at this test I was more nervous and had more doubts. Now I feel more relaxed, but this is only the first test, in February. When we go racing it will be different, because there will be that pressure, although I work well under those conditions. If I place fourth, fifth, sixth… people will say that it's a disaster, and likewise if I finish second, they will say that I could have done better. Last year I had the advantage of every result being good. What happened to the King of COTA? 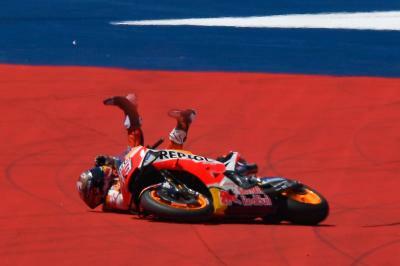 Marquez crashed out of the lead at the Red Bull Grand Prix of the Americas. What happened? The number 93 explains all! FREE: Marquez crashes... the King of COTA is out!